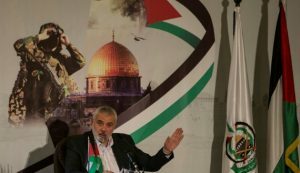 The leader of the Islamist Hamas movement Wednesday told reporters that Egyptian officials are sensitive to the plight of Palestinians in the enclaved Strip of Gaza in reference to recent rapprochement between the movement and Cairo. 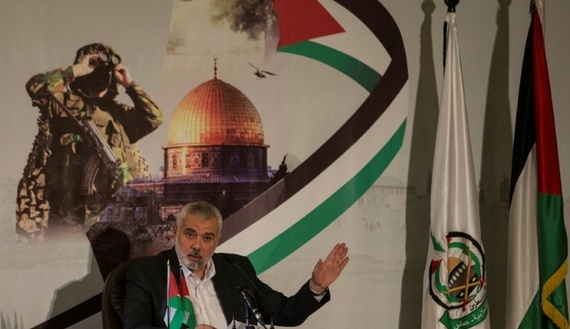 “Egyptian authorities issued a package of measures and policies and fuel began to enter to the power plant, and work continues at the Rafah crossing which will reopen in the near future,” said Ismail Haniya. “The result will have the effect of alleviating the burden of the siege against our people in the Gaza Strip,” he added. Gaza has been under Israeli blockade since the movement took control of the Strip after fighting with rival Fatah following win of the 2006 elections by the movement. Egypt which also shares border with the enclave tightened restrictions at the Rafah border. Relations between Cairo and Gaza city cooled following the overthrow of Islamist Egyptian President Mohamed Morsi in 2013. A weeklong stay in Cairo of a Gazan delegation headed by Haniya in June brought the two sides closer at the time Gaza faced a drastic power shortage, threatening the collapse of hospitals in the Strip and a humanitarian disaster. Cairo accepted to ease restrictions at its Rafah border and help remedy the power crisis against a number of conditions including handover of 17 men wanted by Egyptian authorities on terror-related charges, halt of arms smuggling in Egypt and of support for militants in the Sinai as well as providing information on secret tunnels. Cairo last month began delivery of a million liters (264,200 gallons) of fuel to Gaza, temporarily easing a power crisis that had left the Palestinian enclave’s two million residents with only a few hours of electricity per day. The Islamist movement also last week announced beginning the establishment of a safe zone along its southern border with Egypt. Written by: KanelkaTagba on July 6, 2017. Posted by KanelkaTagba on Jul 6 2017. Filed under Headlines, World News. You can follow any responses to this entry through the RSS 2.0. Both comments and pings are currently closed.